St John’s RC Academy – which came into existence in 2009 with the merger of St John’s Primary and St Columba’s High School – is a Catholic, 2-18 all through school. 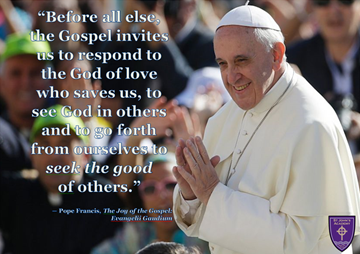 Our motto is Seek the Good. The Academy is situated on the site of the former St Columba’s High School within a purpose built community campus, which was funded via the Investment in Learning programme. 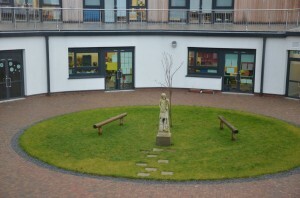 The secondary part of the school opened with North Inch Community Campus in March 2010, with the primary and nursery opening in November 2011. The official opening of North Inch Community Campus and St John’s RC Academy was on 20th December 2011 by Mr John Swinney MSP. The facilities include 3 and 4 court games halls, a dance studio, fitness suite, drama facilities, a recording studio, a full public library as well as first class teaching areas and an integrated support base to support pupils and families. The school has a peaceful setting, close to the banks of the River Tay, at the top of the North Inch, with outstanding views to the Highlands. St John’s RC Academy’s school community is one of the most diverse in Perth and Kinross. Our school is proud to be truly comprehensive with pupils from the whole range of socio-economic backgrounds. Our community boasts a rich array of ethnic backgrounds, and all are made very welcome within our inclusive Catholic ethos. The Headteacher of St John’s RC Academy and Campus Leader of North Inch Community Campus is Mr Seán Hagney.